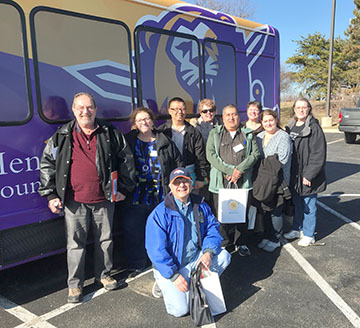 McHenry County College literacy volunteers pause for a photo after attending the 28th Annual On the Road to Literacy Conference at the University of Illinois at Chicago. Pictured are, front row, kneeling, Stan Roelker and back row, Anthony Palucci, Susan Levels, Thomas Nguyen, Sharon Borland, Thomas Alva (student), Pam Russell, Michele Mangin and Tina Wilson. McHenry County College is offering free training for anyone who is interested in becoming a volunteer literacy tutor for reading, math and/or English language skills. Four 2-hour training sessions are required to become a literacy tutor. The Tuesday trainings take place from 10 a.m. to 12 p.m. on April 23 and 30, May 7 and 14 in Room B169/169. The Thursday trainings take place from 6-8 p.m. April 25, May 2, 9 and 16 in Room A112. Monday and Wednesday trainings are offered during the month of June. MCC’s Adult Education Department provides county residents with an opportunity to tutor adult students in reading, math or English as a Second Language. Anyone over the age of 18 with a desire to make a difference in someone’s life is encouraged to attend. A literacy volunteer tutor does not have to speak a second language or have any teaching experience to tutor in the adult education literacy program. Volunteer tutors will receive free basic training that provides the information and skills needed to work with literacy students. Last year more than 100 volunteers tutored over 380 adult learners. Tutors helped students improve their proficiency in English and provided basic reading and math skills. Instructional materials are also provided along with the support from MCC’s Adult Education staff and faculty. To register, go to www.mchenry.edu/volunteer, scroll to the purple “Contact” heading and click on “ask Marie Day to contact you” and you will receive all the information needed to begin your training. For more information, call Marie Day at (815) 455-8542 or visit the website: www.mchenry.edu/volunteer.